Wahala de oo, just when some peeps moved from blackberry to Android devices to enable them use Android apps, blackberry has just upgraded their os10, there by allowing their bb10 and z10 users to install Android apps. All you have to do is just upgrade your previous BB10Os to BB10.2.1. The new BB10Os 10.2.1 comes with amazing features far better than the previous. If you are still using curve, touch, bold 5, and the rest of them. Its high time you consider switching to BB10 with a longer life. ==>Download any app of your choice from the third party sites above using your blackberry device. ==>Install the Apk file on your Blackberry10 device. Your Android App should start installing after a short "processing" indicator, Tap the install button located at the top right, and tap the accept on the popup window which informs you of the device permissions that are required for the app to run. 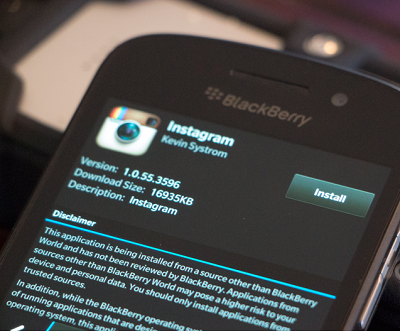 Even Instagram works perfectly well on the blackberry 10 device. Blackberry don follow port ooo. Blackberry is not smiling oo.